A military doctor faces the challenge of unifying two roles difficult to reconcile: soldier and doctor. In the field, this often leads to moral conflicts. In the face of limited funds and resources, who will be treated first—the comrade, the civilian or the enemy? The pressure on medical personnel and doctors rises. On the battlefield, they enjoy special protection. However, recent crises show that medical personnel are more and more in the crosshairs. Which military, IHL or ethical principles can they rely on in case of an emergency? 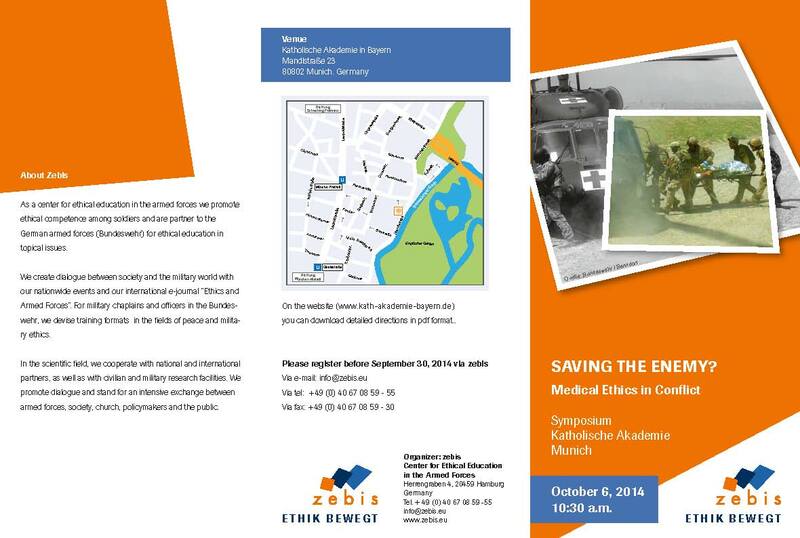 In our symposium “Saving the Enemy—Medical Ethics in Conflict?”, we will pose ethical questions on the basis of concrete field scenarios and provide answers. International and national experts such as Prof. Dr. Michael Gross, Prof. Dr. Peter Olsthoorn, Dr. phil. Daniel Messelken, Reserve Lieutenant Colonel Cord von Einem or Reserve OStArzt Dr. med. Dirk Fischer give answers and discuss these issues with you in working groups. We appreciate your participation and kindly ask for registration via a short email at info@zebis.eu. We also would very much appreciate you forwarding this email to other interested parties. Any announcement, reference to our event or reporting about this important topic is very welcome.